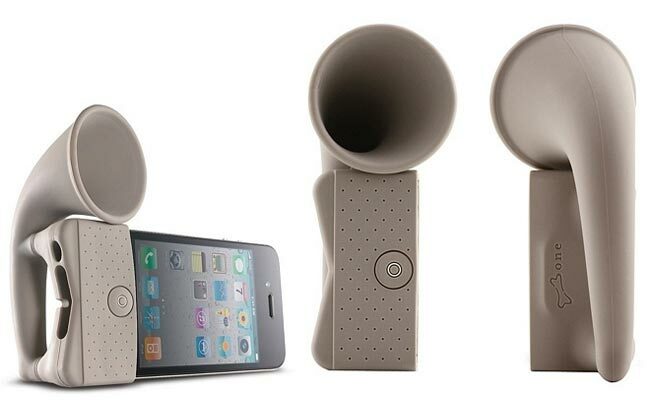 The Bone Horn Stand is an un-powered amplifier for the iPhone 4, it works exactly like those old style horn speakers that are found on gramophones, and the speaker is fitted over the end of the iPhone where the built in speakers are. The sound is the channelled through the horn, and according to the manufacture it will add 12 decibels of sound pressure to your iPhone’s built in speakers, and as you can see in the photo it can also be used as a stand. The Bone Horn Stand iPhone Speaker is now available for $25 from CyberGuys. Make sure you read our article on the difference between the iPhone 4 and iPhone 4S.